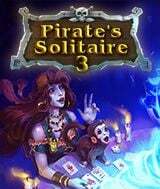 Download Pirates Solitaire 3 for free at FreeRide Games! 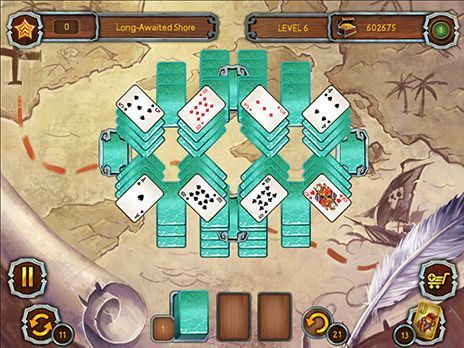 Reveal the secret of a treasure island in Pirates Solitaire! The Jolly Roger is raised, the ship is ready to sail and adventures in the Caribbean are about to begin... But wheres the pirate treasure? Maybe Captain Flints map holds the answer? No! The cards know the answer... the cards of Pirates Solitaire - 120 unique solitaire layouts in which youll have to search for the old pirates treasure! Classic solitaire with a new and unique mechanic  collect pairs of cards by using various bonuses: mulligan, shuffle and joker. Any card on the table provides a reward, and a special multiplier can make it far more valuable. Find card pairs faster and keep an eye on the multiplier! Whats that? You say youre an experienced sea dog and you need a truly fierce sea battle? Then select ""Sea Dog"" difficulty and complete the 12 locations over again, but with new rules! So, is your ship ready to take on board... unique pirate-themed graphics? Exciting card gameplay both for young captains and hardened pirates alike? And a multitude of bonus rewards? On top of all that, therell be jolly pirate music to make this card game a real adventure on the Caribbean sea!